Two new films highlight a politically fractured America. At the risk of stating the obvious: America is kind of a mess right now. We might disagree about the specific ways in which it's a mess, but that's part of the problem. More to the point, we don't even know how to disagree about what the mess is, or how to interact with people in our lives—some of them friends or blood relatives—who seem to have a fundamentally different understanding of where to start cleaning it up. Storytellers, not surprisingly, have been wrestling with this issue a lot over the past few years, but two new films with radically different tones dig specifically into the question of when to raise your voice, and whom you might piss off by doing so. 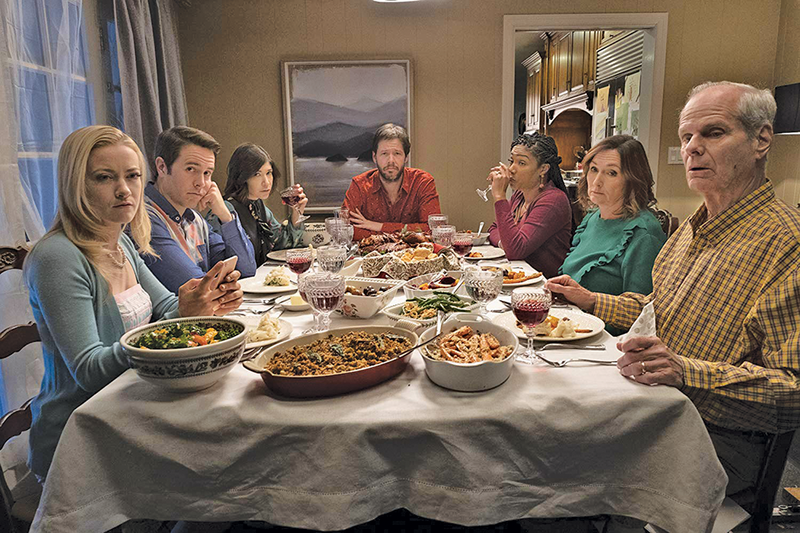 That notion gets a darkly satirical spin in writer/director/star Ike Barinholtz's The Oath, which takes the notion of an uncomfortable family Thanksgiving and turns it into a horror film. Chris (Barinholtz) and Kai (Tiffany Haddish) are a proudly liberal couple—he displays a McGovern poster on his office wall, and Geraldine Ferraro's memoir on his desk—who are resisting signing a "voluntary" loyalty oath to the president with a deadline fast approaching on the day after Thanksgiving. Adding to the tension, as news reports trickle in about violent protests, is the fact that Chris and Kai are hosting Chris' family, including his parents (Nora Dunn and Chris Ellis), his right-leaning brother, Pat (Ike's actual brother, Jon Barinholtz), and more liberal sister, Alice (Carrie Brownstein). The ensuing family gathering becomes the expected catastrophe of accusations and recriminations, with Chris righteously raging at everyone who has agreed to sign the oath. Barinholtz finds a few solid comedic moments—the influence of social media gets a skewering as Chris' similarly conservative girlfriend (Meredith Hagner) insists her source of a rumor is reliable because "he's verified"—but actual laughs are infrequent as The Oath leans into the discomfort of realizing you might share DNA with people, but not values. Events take a violent turn with the arrival of a pair of government agents (John Cho and Billy Magnussen) investigating Chris, forcing the clan to work as something resembling a team. There's a surprising complexity to the way Barinholtz digs into the tension between the things you claim to believe and the people you claim to love, but it sometimes feels like he's running around in circles before settling on the fairly depressing notion: We're all going to be tribal, so it might as well be with our own familial tribes. 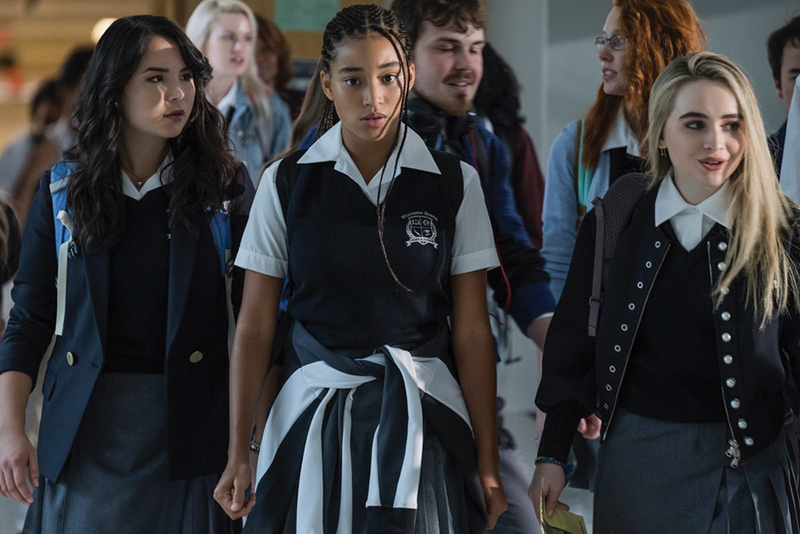 The struggle faced by Starr Carter (Amandla Stenberg) in The Hate U Give is in some ways less complicated, but also more nuanced. A 16-year-old high school student, Starr splits her life between the primarily black community where she lives and the predominantly white private school she attends. When she's a passenger in a car with her childhood friend Khalil (Algee Smith) during a traffic stop, where the unarmed Khalil is shot and killed by a white police officer, Starr is confronted with whether to go public with what she saw. Director George Tillman Jr. and screenwriter Audrey Wells do an impressive job of adapting Angie Thomas' young adult novel, including the creation of a key scene building the connection between Starr and Khalil. There's a strong cast—the ever-maturing Stenberg, Russell Hornsby and Regina Hall as Starr's parents, Anthony Mackie as a neighborhood gang leader—to provide the emotional core, ensuring that The Hate U Give never turns into a mere collection of debates about hot-button issues. But those issues are always swirling, and the film generates a prickly, uncompromising energy as it touches on not just police violence against people of color, but also the complexity of code-switching and the question of who is responsible for the fate of black communities. As we watch Starr come to terms with her own ability to fight for change, she also has to ask herself hard questions about who might be included among those she's fighting against: Her police officer Uncle Carlos (Common)? Her white boyfriend (K.J. Apa) and best friend (Sabrina Carpenter)? Where The Oath finds its moral center in the ties of family, The Hate U Give offers an even richer vision of who we should wrap our arms around, and why. Update Oct. 17: Local release date for The Oath has been postponed until a date to be determined.